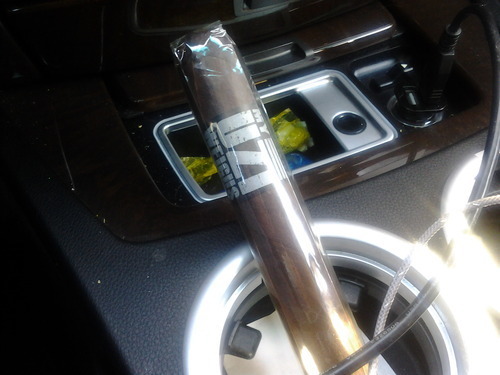 Construction/Appearance: The San Andres wrapper has a chocolate appearance that is both rich and oily. The beautiful wrapper is toothy with only one prominent vein running the length of the cigar. I find the MUWAT well packed with minimal give leading me to believe this cigar will last a very long time. The cap on the head is done nicely, smooth and I don’t notice any holes or tears on the cigar itself. Considering the name of the cigar, it really doesn’t weigh a ton and feels average in terms of weight for the size. The band is very simple, a mix of black and gray colors stating the name of the cigar and nothing more. Less is definitely more in this situation as the focus is put on the cigar as opposed to fancy packaging or labeling. Burn/Draw: I made a solid cut with the guillotine across the head and actually had to put some effort behind it because of the amount of resistance. The cold draw was semi loose but that really didn’t bother me as much as the larger ring gauge. No scientific, conclusive, statistically significant data backing this up, but I did feel lighting/toasting the slightly larger vitola took a bit longer than usual probably so the cigar would heat evenly. While the burn started out wavy with some jaggedness, the cigar did correct itself for the most part. However, both cigars smoked for the review required relights but it didn’t take away tremendously from the experience. The draw felt good for the size and was smooth. There was always a steady stream of smoke coming from the cigar between draws and “a ton” whenever I took a draw. On almost every exhale I picked up enough smoke through the nose to taste various flavors. The ash was a brilliant white color with an almost smooth texture lasting 1 1/2 inches before it fell. Flavor/Aroma: The prelight aroma on the wrapper has some wonderful notes of cedar and chocolate but it has an overall rich spicy body. The foot gave off chocolate notes similar to making brownies. On the initial draw, I found it pleasantly loaded with pepper, cinnamon and wood notes. The aroma filled with cocoa is already in my face with the amount of smoke being put out. As I enter the first third, there segments of coffee and nuts upfront. Further into the third I get wood and more specifically oak notes mixed in as well with a syrupy (molasses) undertone. Anyone who expects nicotine bomb just by the name will be sorely mistaken. 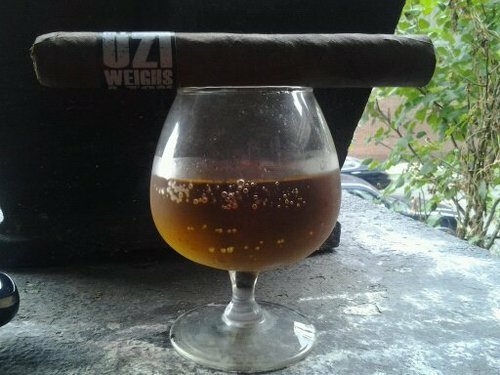 The cigar feels balanced with the variety of flavors and is medium in terms of body and strength. The second third continues with same notes though I start to notice some almonds along with the coffee and mild pepper. I feel like there is some leather mixed in but it’s too sporadic for me to put my finger on it. The profile is smooth and creamy and even though the flavors haven’t changed dramatically, there is a certain richness to them. At this point, the MUWAT is progressing to a very positive direction. In the last part, coffee and some cocoa are coating the palate. However, the delicious flavors that showered my experience in the second have taken a step back. Instead, notes of wood with some mild pepper outline the profile. With a little more than an inch left, I decide to put the medium bodied/strength cigar down. Final Thoughts: As you may have noticed, I’m not a fan of large ring gauge cigars. However, after a while, I almost forgot that I was smoking a 60 ring. The draw was pleasant which allowed me to focus on the flavors and experience. Solid ash, very good construction. However, I did notice that I had to relight the cigar a few times once I passed the halfway point. It wasn’t overly bothersome but I also couldn’t figure out why even when I varied my time between draws and still ended up with the same results. The flavors in the first third led me down a path that was exciting. When I reached the second part, the flavors had a bit more depth and richness to them. And then the last third showed up and essentially took some of the fun in the cigar. The last part wasn’t bad by any means but the MUWAT built up this expectation that I wanted to see it through to the end which obviously didn’t happen. The MUWAT isn’t overly complex but instead presents a good array of flavors that most people enjoy. I think keeping the strength down allows less experienced smokers to try a cigar in their wheelhouse of vitolas. While this cigar is becoming one of my favorites daily go to cigars, I feel some people will really take liking to it and that’s perfectly fine. 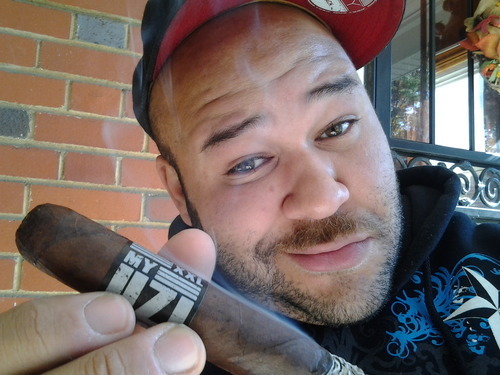 This cigar literally blew my mind I really wish I had not waited so long to review this cigar but it was worth it!!!!! !